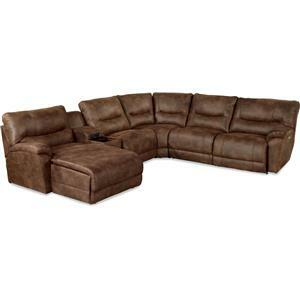 One of many sectional configurations available, this home theater sectional has a luxurious look and spacious seats. 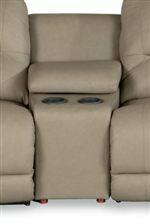 Three reclining seats are plushly cushioned by thick pillow arms, chaise cushions, and bustle backs with extra lower back support. 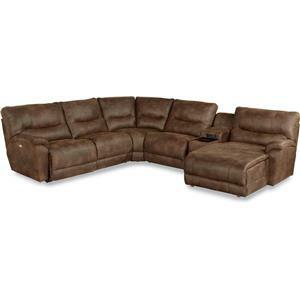 Two storage consoles with built-in cupholders are also included in this sofa, allowing you to enjoy your favorite beverages at movie night or the big game. Choose from a huge selection of fabric or leather cover materials to best match your place. All covers are decoratively adorned with double needle topstitching. 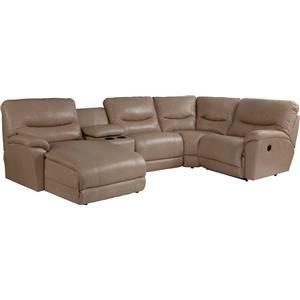 The Dawson Casual Power Reclining Home Theater Sectional by La-Z-Boy at Morris Home in the Dayton, Cincinnati, Columbus, Ohio, Northern Kentucky area. Product availability may vary. Contact us for the most current availability on this product. 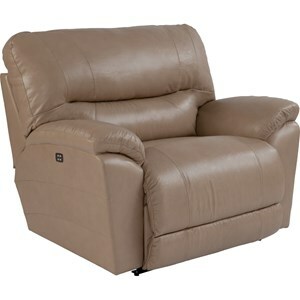 40S720 Armless Reclining Chair 1 33.5" 39" 41"
4BP720 Power La-Z-Time® RAS Recliner 1 42" 39" 41"
4AP720 Power La-Z-Time® LAS Recliner 1 42" 39" 41"
4TW720 Storage Wedge 2 24" 36.5" 35.5"
Padding & Ergonomics La-Z-Boy Memory Foam is the perfect balance of softness and support that’s unforgettably comfortable. Add 2? 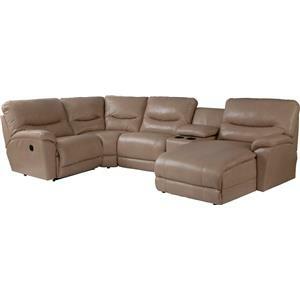 Layer of premium memory foam on the seat, chaise and footrest of select reclining chairs, loveseats and sofas for extra softness that adjusts to you. High Density Qualux® foam base is highly resilient for superior support that helps reduce pressure points in all positions, upright and reclined. Warranty WARRANTIES ARE FOR REPAIR, REPLACEMENT, OR SUBSTITUTION ONLY, IN LA-Z-BOY’S SOLE DISCRETION. 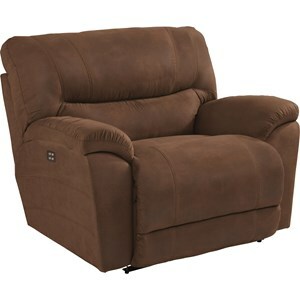 Sprawl out on a Dawson recliner, and relax in your own sweet time. Fill your space with a spacious reclining chair or sectional sofa, and your whole family will be eager to enjoy this soft, supportive comfort. Resilient memory foam cushions and plush pillow arms gently envelop your body as you lounge. Casually styled, the Dawson collection features a tufted back design and double-needle topstitching. 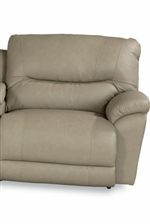 Dawson recliners are available with manual and power recline, as well as customizable fabric or leather covers so you can pick the piece that truly fits with your lifestyle and distinct tastes. The Dawson collection is a great option if you are looking for Casual furniture in the Dayton, Cincinnati, Columbus, Ohio, Northern Kentucky area. Browse other items in the Dawson collection from Morris Home in the Dayton, Cincinnati, Columbus, Ohio, Northern Kentucky area.